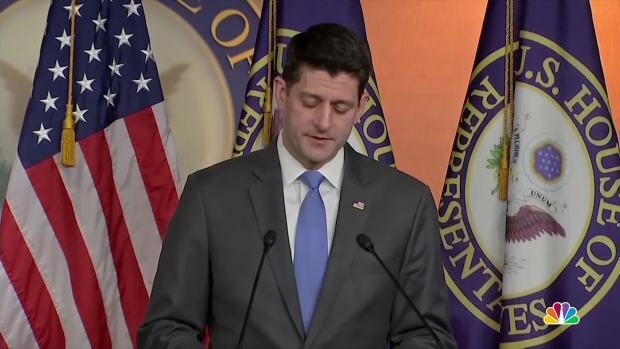 Paul Ryan pushed back on suggestions that a vote for House speaker should take place now, saying it would be "needless distractions from the task at hand"
"I think we all believe that Kevin is the right person," Ryan said in a "Meet the Press" interview to be aired Sunday. He then clarified that "our leadership team" thinks he's the right man for the job, not necessarily "every single person in Congress." The Wisconsin Republican said McCarthy could get the votes because "we have gotten a lot done." Ryan added that House Majority Whip Steve Scalise, R-La., another representative some thought could be a replacement, also believes McCarthy should fill Ryan's role. Ryan pushed back on suggestions that a vote for House speaker should take place now, saying it would be "needless distractions from the task at hand." "I think what we want to do is focus on getting our jobs done," he said. "What we want to do is focus on executing our agenda, focus on fighting for our majority."